In Alaska’s harsh conditions, the coating is just as important as the weld. STEELFAB has the state’s largest indoor, climate-controlled, multi-material paint facility used exclusively for coating metal materials. Our 12,000-square-foot paint shop operates year-round and features two five-ton cranes and a 100-foot shotblaster that preps steel and other metals in short order. An adjacent 1,000-square-foot blasting tent further expands our capacity and efficiency. We maintain a sophisticated paint and coating endorsement from the American Institute of Steel Construction. 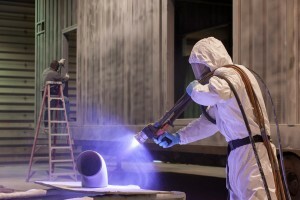 The paint shop supervisory personnel are NACE certified inspectors and all paint shop employees are certified by the Society of Protective Coatings and STEELFAB is a NACE International Member.